Throwing a Super Bowl party for kids? These party games inspired by the commercials might just keep them laughing more than the ads themselves. Before the big game, print out some Super Bowl commercial scorecards where guests can rate the commercials according to categories such as favorite funniest, weirdest, dumbest, coolest and least favorite. Print your categories on the score sheet and leave blank spaces where players can write in the names of their choices next to each category. They can also give each ad a star rating from one to five (or whatever rating system you choose), and leave some comments of their own (these are fun to read aloud later). When the game is over, add up all of the answers and ratings from players’ sheets and announce the winning commercials. To play this game, hand out blank Bingo cards (you can make your own Bingo cards and leave the boxes empty). Before the ads start airing, have players fill the boxes on their cards with the names of brands or ads they expect to see during the game (You can use brand names, or simply have kids write things that are a bit more generic, such as beer ad, car ad or snack food ad.) The rules about how specific a category must be should be determined by the age group of your players. Have game prizes on hand for players who score Bingos during the game. This is a fun game that will keep everyone alert during the commercial breaks. When guests are gathered around the viewing area, bring a football into the room and hand it to one player. Pass out lists of things they may see during the commercials (make the lists ahead of time). Anytime something on the list is shown (or said) during an ad, the person holding the football has to pass it to the next player. When the round of ads is done, the person holding the football is out. Keep playing throughout the duration of the game, or until only one player is left. If everyone is out early, start again. If you see a car, pass the ball to the left. If you see a beer ad, pass the ball three times to the right. If you’re holding the football when an ad that features a dog is shown, stand up, bark three times and pass the ball to the left. If you’re holding the football and see a celebrity in an ad, keep the ball, but switch places with the person two seats to your right. Before game time, write down some of the commercials that typically air during the Super Bowl. Fold them up and place them in a football helmet. Divide guests into teams of two or three people. Give them some props and some time to make up and rehearse their own commercials. 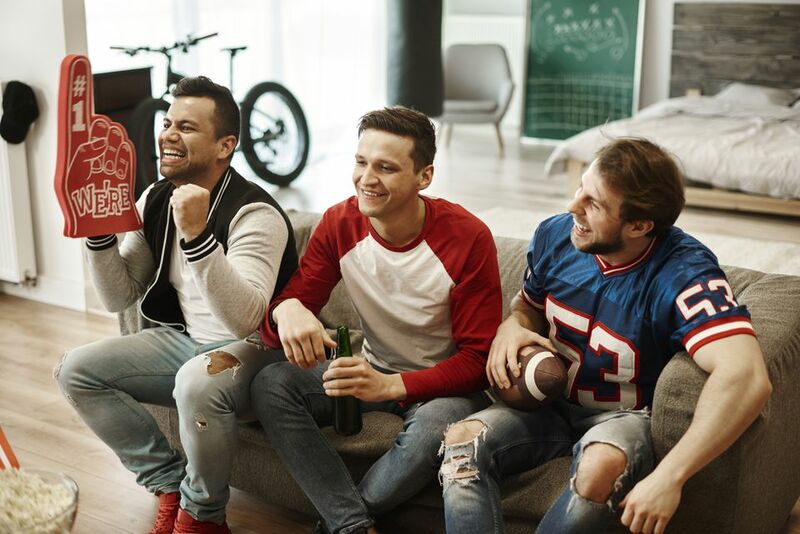 During halftime, have each team present its commercial to the rest of the guests, who will vote for their favorites in categories like funniest, most interesting, most creative or whatever suits your particular group of ads. When the game begins, have everyone guess what the first commercial of the break will be. Have everyone who guessed correctly stand up while everyone who guessed incorrectly remains seated. Standing players will then guess what the next ad will be, and again, anyone correct remains standing. All players left standing when the game resumes gets a point. Play this game during every commercial break, and see who has the most points at the end of the game.